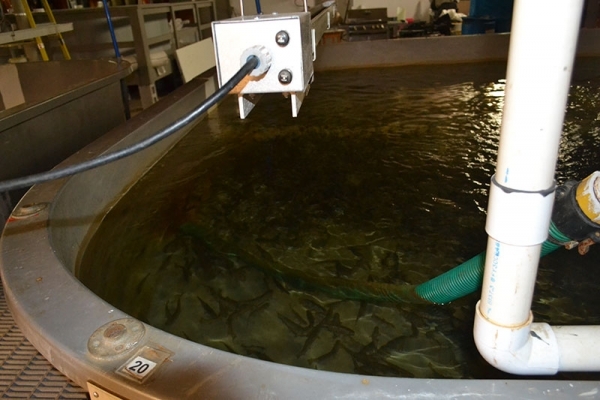 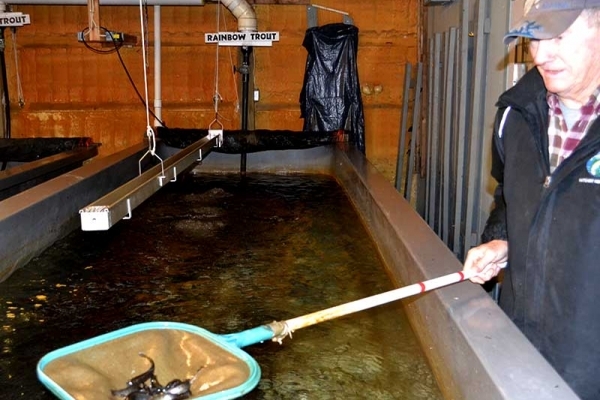 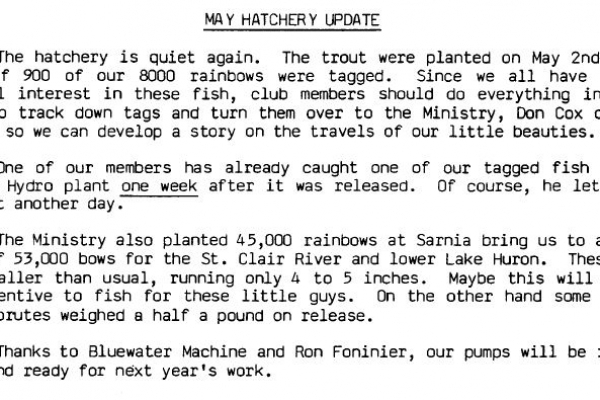 The Bluewater Anglers have been in the fish raising business since 1982 with the introduction of rainbow trout into a two tank training facility at the Lambton County Water Supply facility located at the head of the St. Clair River. 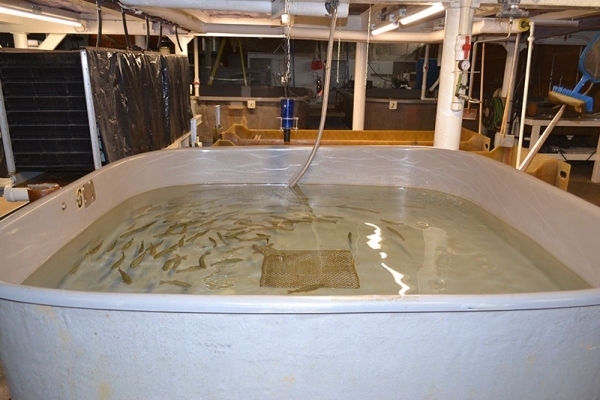 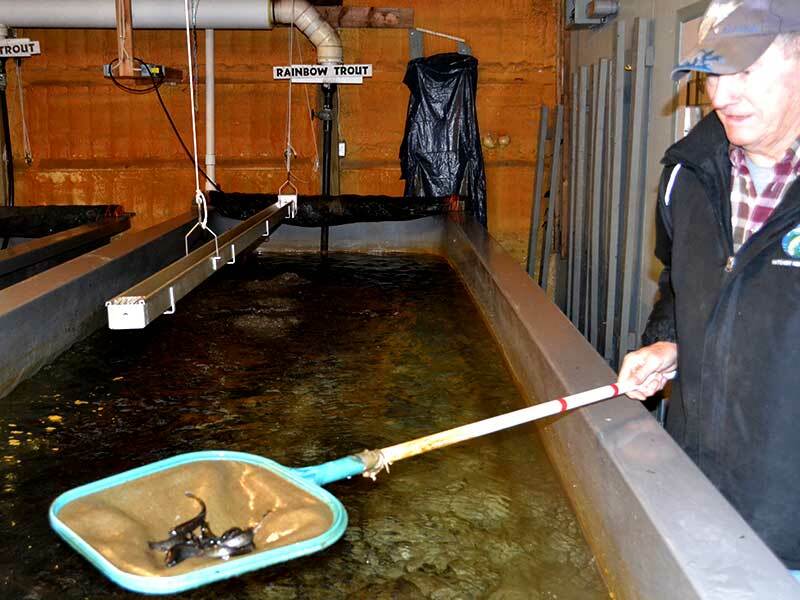 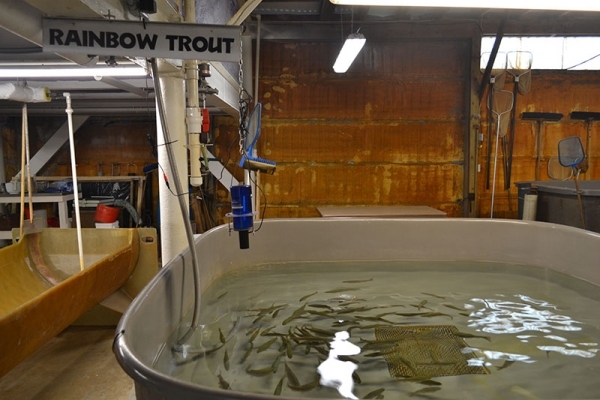 Several years later the anglers built an indoor facility for the annual rearing of 150,000 Chinook Salmon and 25,000 Rainbow Trout, with the occasional foreaye into Brown Trout. 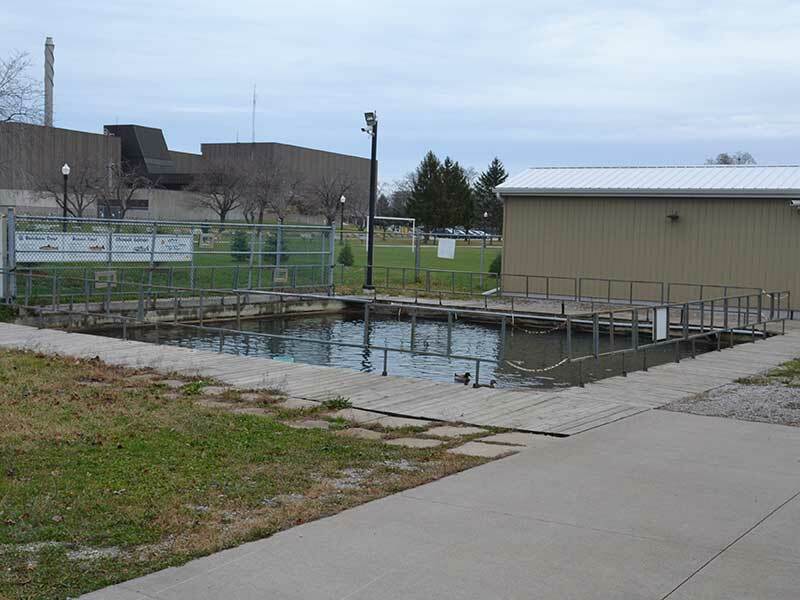 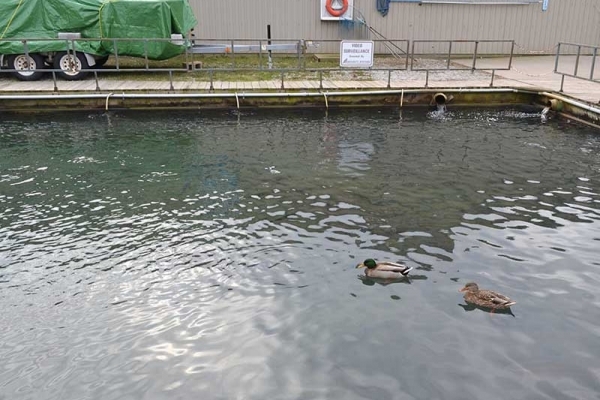 The hatchery is located immediately north of the Bluewater Bridge. 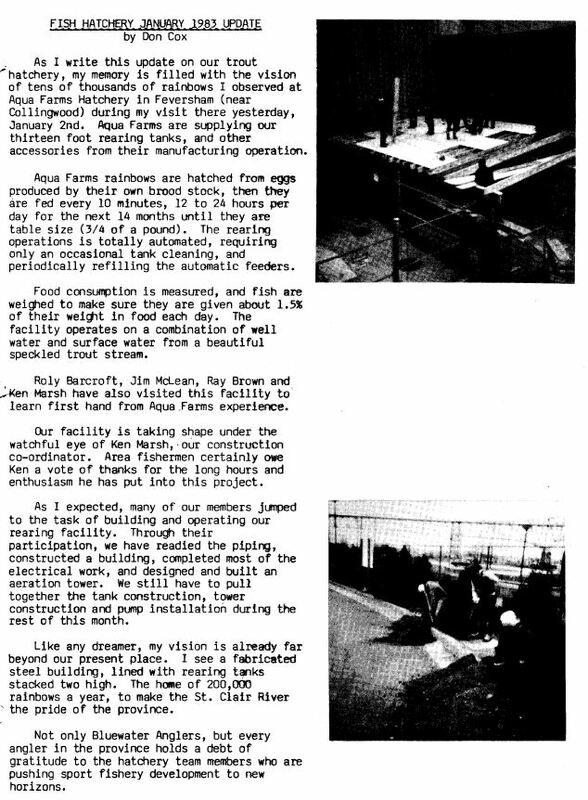 Two wells inside the building provide a safe, 52 F water supply. 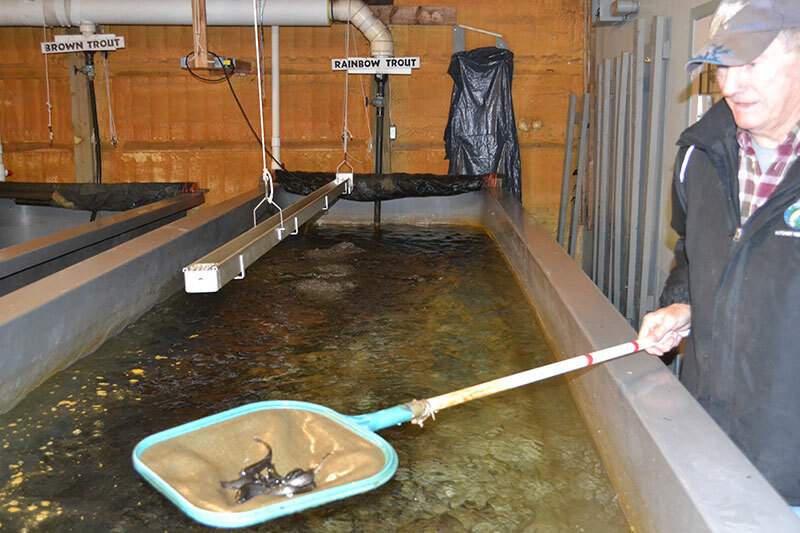 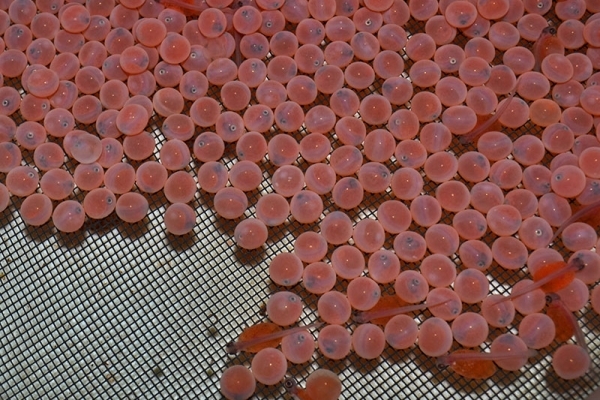 The rearing season begins in September with the collection of Salmon eggs at Owen Sound. 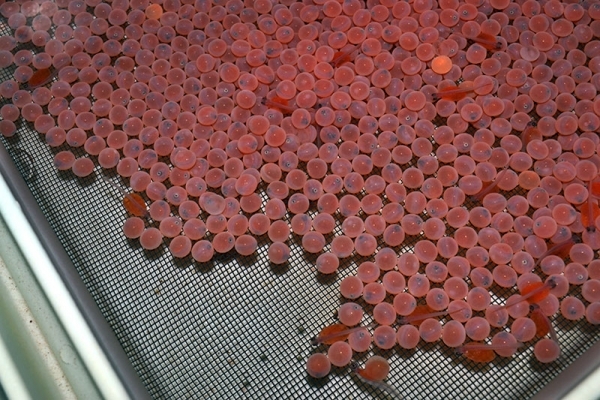 At the same time Rainbow Trout eggs are purchased for the hatchery. 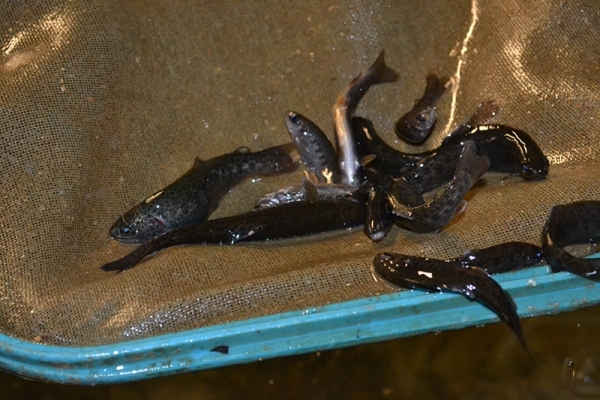 Hatchout of the eggs is complete by December and feeding begins in earnest in the new year. The 3" Salmon are ready for stockout by mid April. 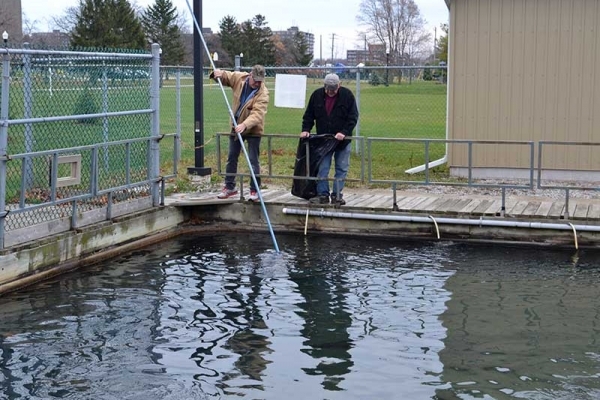 The fish are transported to the upper waters of local Lake Huron streams for subsequent migration to Lake Huron where they live out their 4 year cycle. The Rainbows stay in the hatchery until mid to late May and grow quickly to a 7" size. 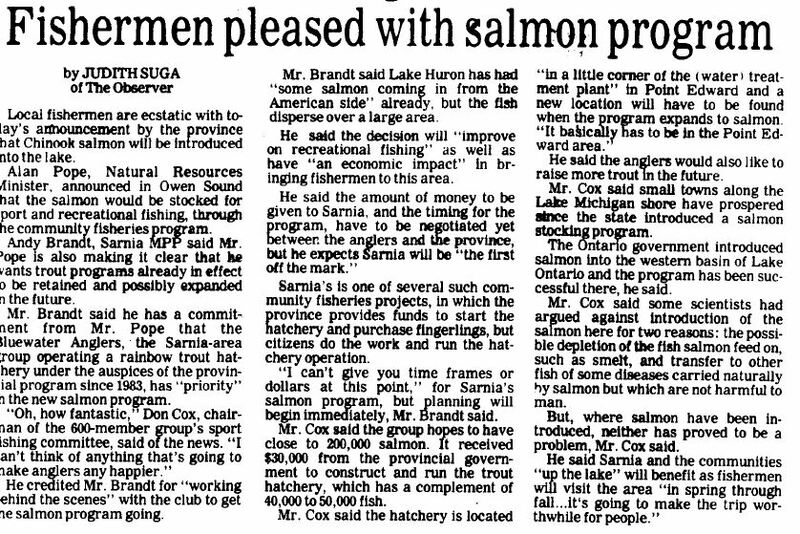 They are stocked within Sarnia city limits. 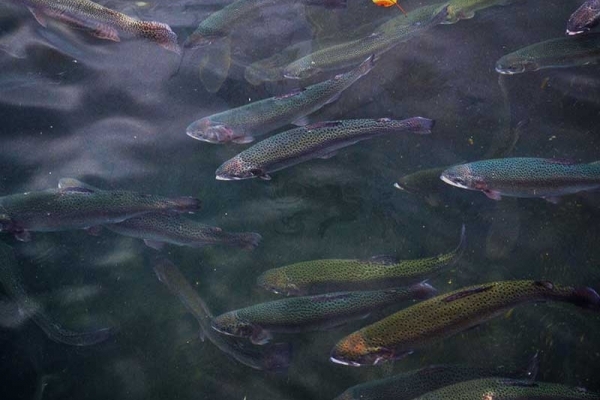 Salmon, Rainbows and Browns are kept in an outside pond to grow to adult size for spectacular fish viewing. They are always eager to jump for food from the vending machines located on site. 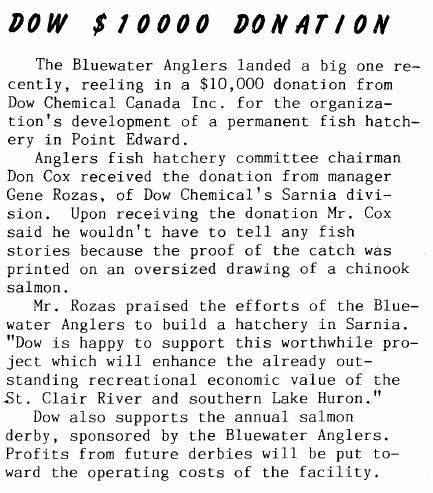 Don't miss this treat if you are in the Bluewater Bridge area. We are always eager to show our facilities to interested parties. 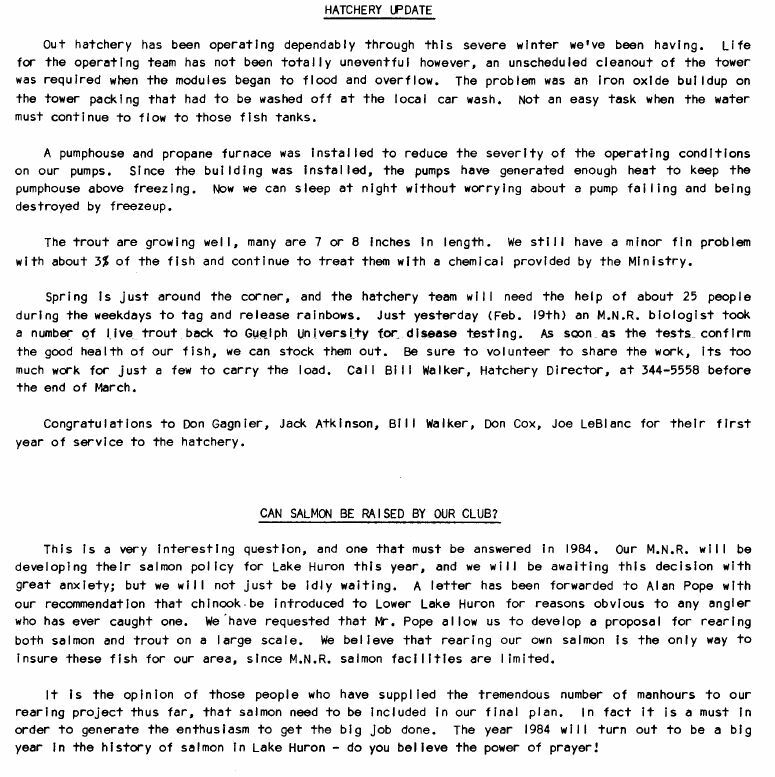 It is our belief that the education is the best way to preserve this great program and support our amazing fishery in the great lakes. 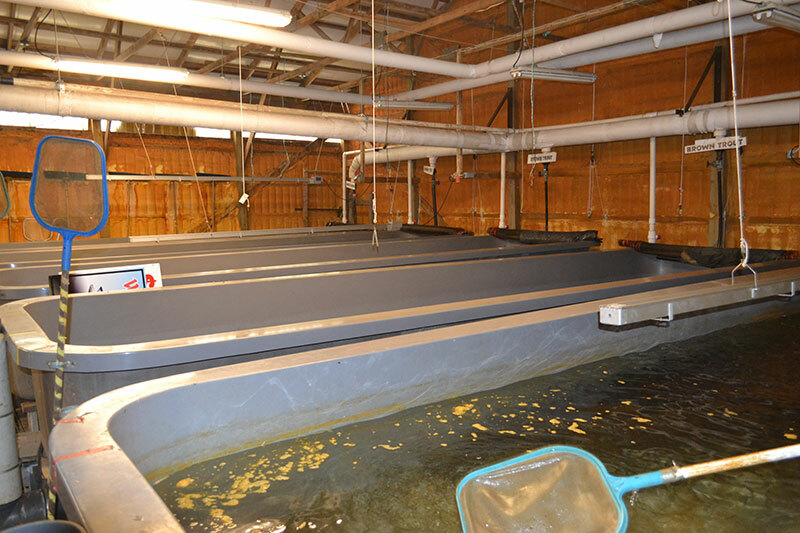 If you are interested in booking a tour of our facilities and learning all about the life cycle of these fish please contact us. We invite everyone to come and feed the fish in our public outdoor pond. 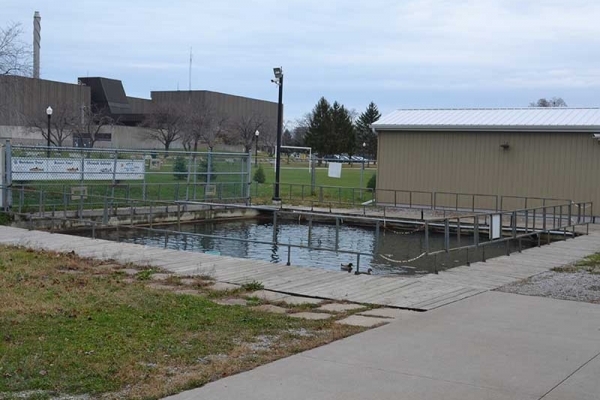 The pond is located on the north side of the hatchery building and is just a one minute walk from the playground and fry trucks under the Bluewater Bridge. 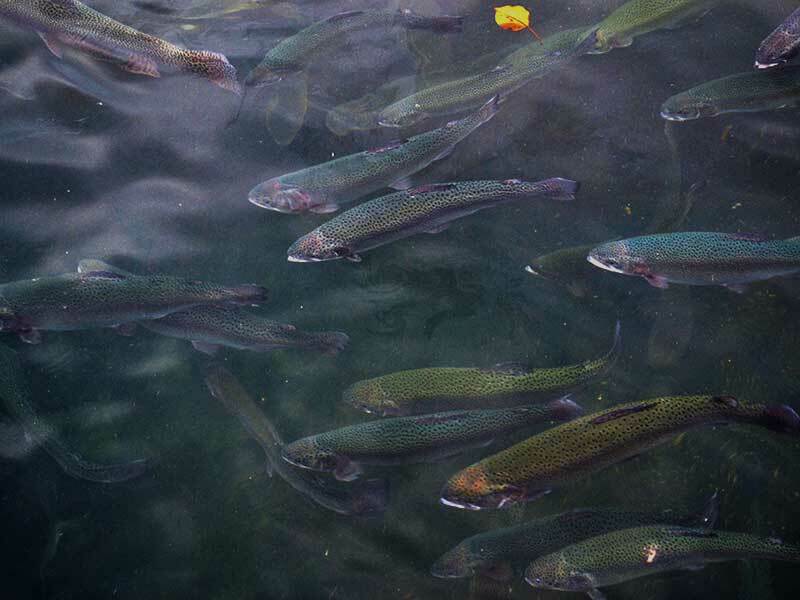 Bring your kids and bring your quarters and help feed the dozens of chinook salmon, rainbow and brown trout that inhabit our pond. 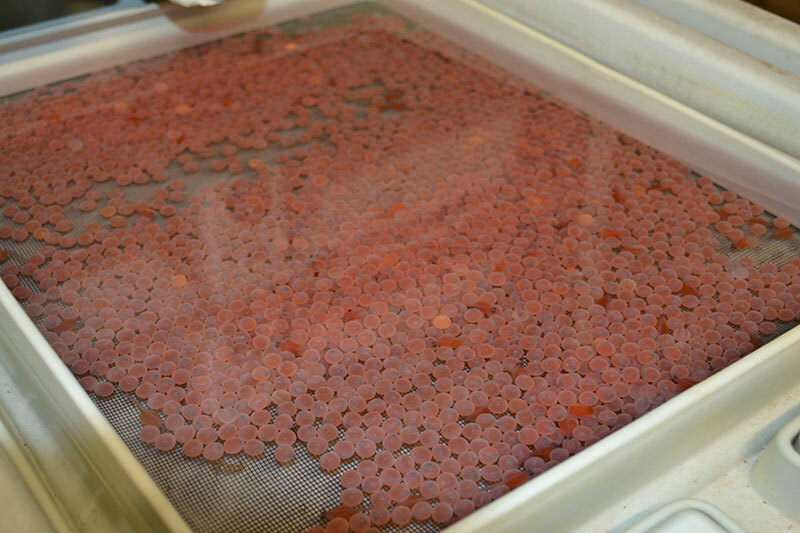 Children love to throw feed pellets into the water and watch as several fish surface and even jump for the food. These fish are always hungry so there is never a bad time to pay them a visit. 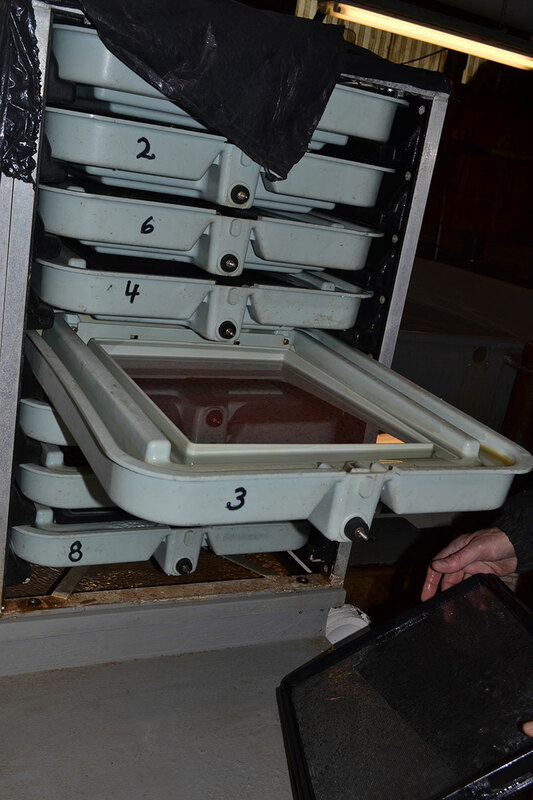 Just remember to bring your quarters for the food vending machines. 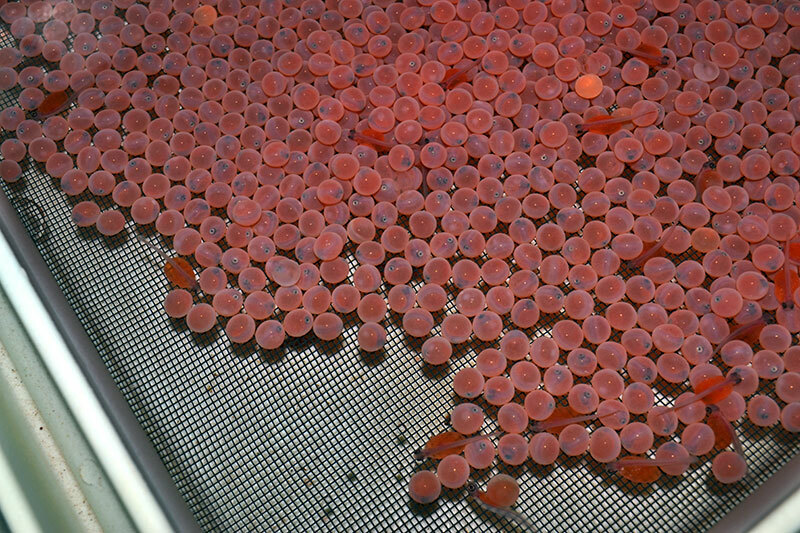 Although they will eat lots of things we ask that you keep to the feed pellets as anythign else can be harmful. 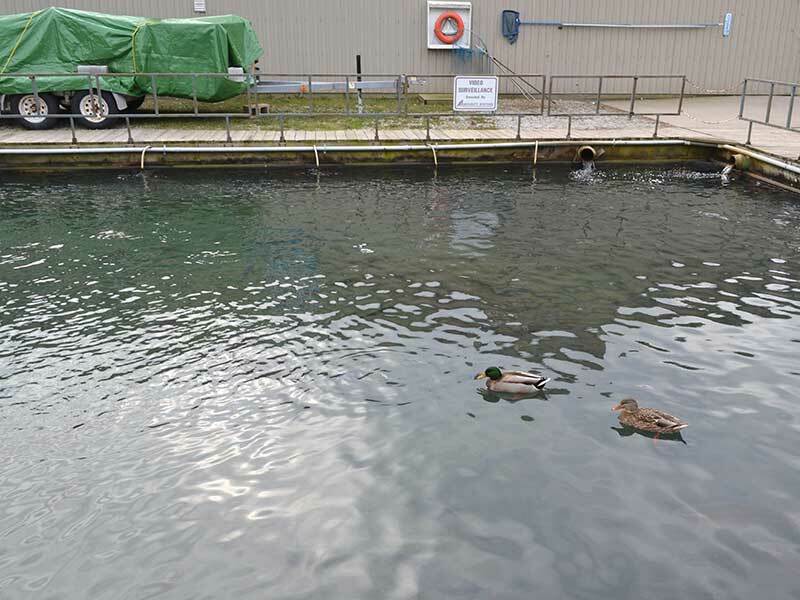 The pond is monitored 24hrs a day by surveilance cameras to keep our fish safe. 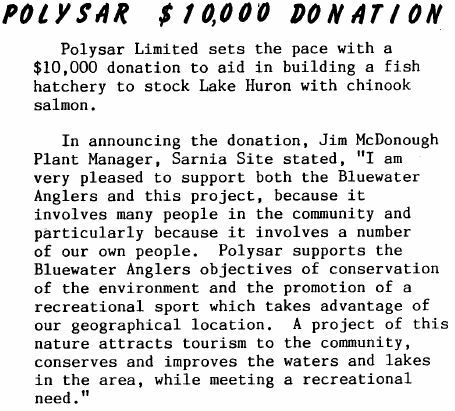 All proceeds gained by the vending machines go to the direct operation of the fish culture station. 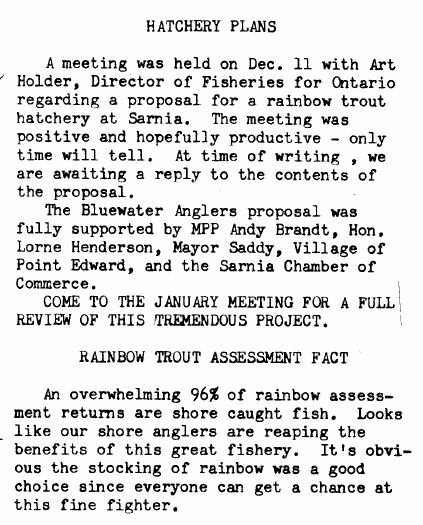 The late Honarable James Auld was approached & through his ministry 40,000 rainbow trout fingerlings were received from the Normandale Hatchery for stocking into Lower Lake Huron. 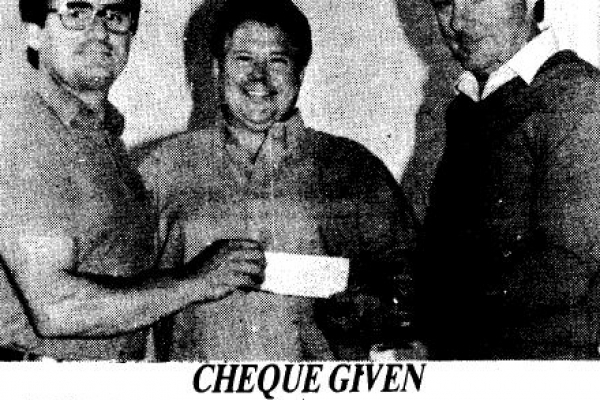 This program continued and was extended with the support of the Honarable Allen Pope. 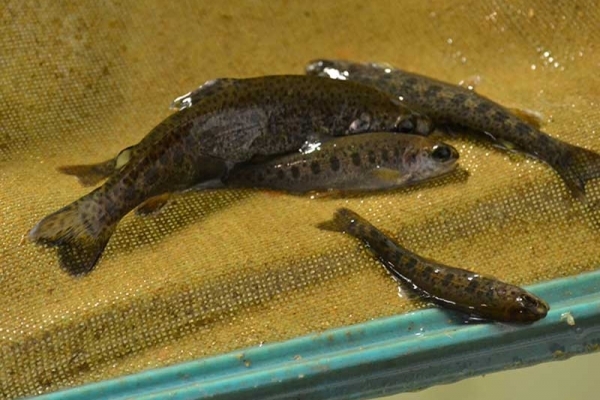 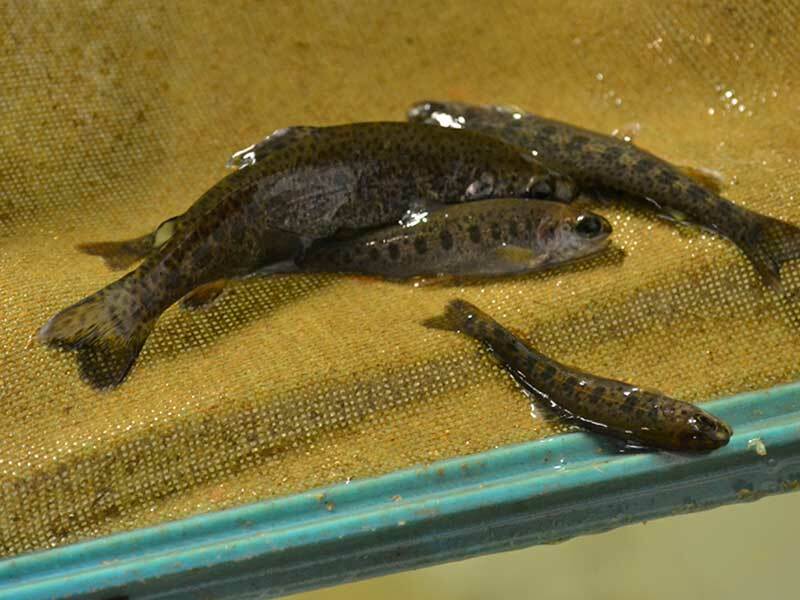 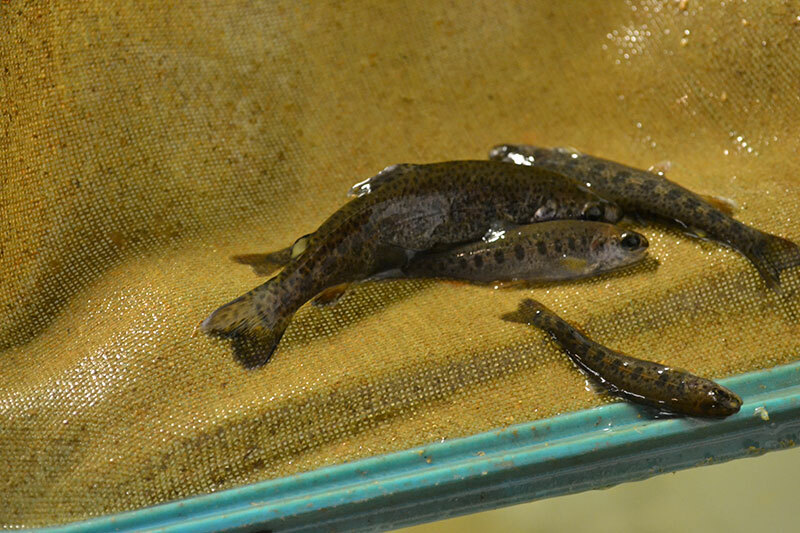 These MNR Rainbow Trout fingerlings were delivered to our waters where the Bluewater Anglers Club members took over tagging of these fish for the MNR and also provided creel census data to the MNR. 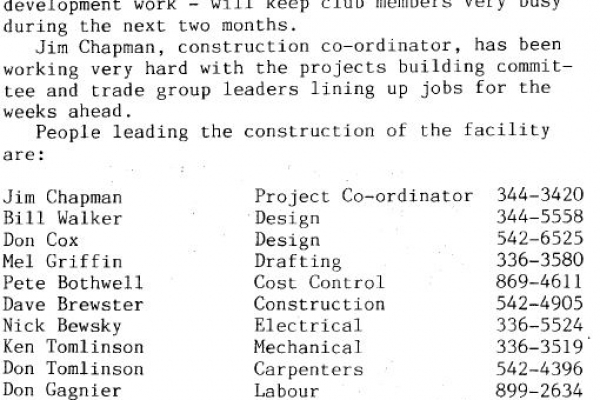 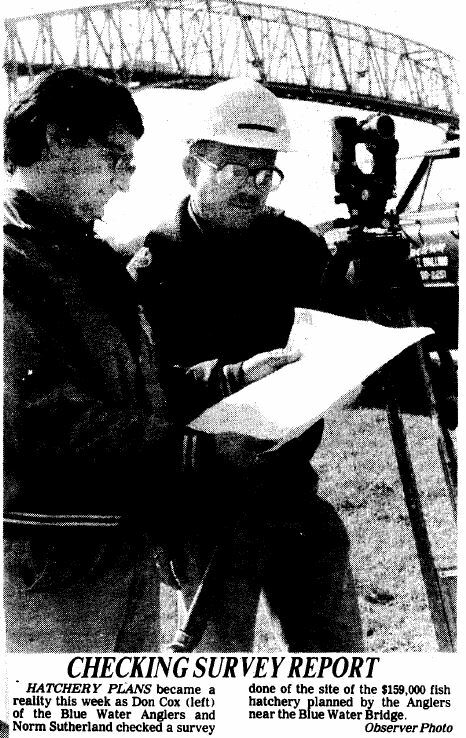 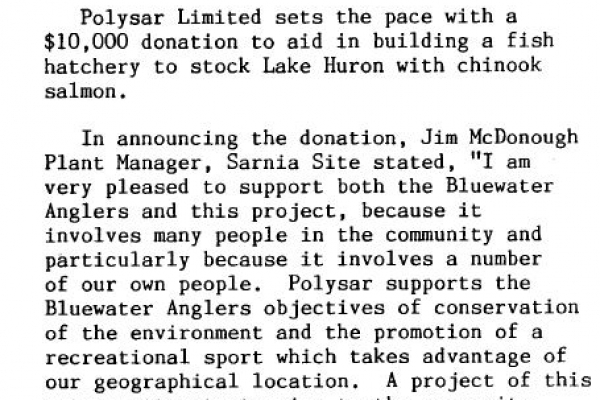 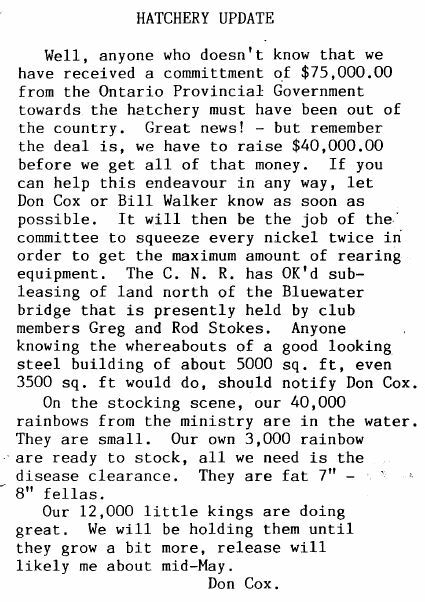 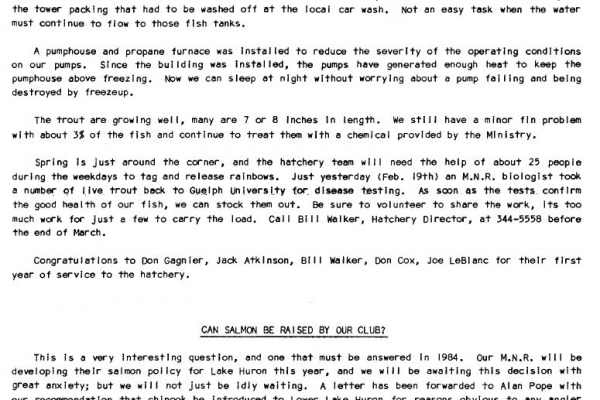 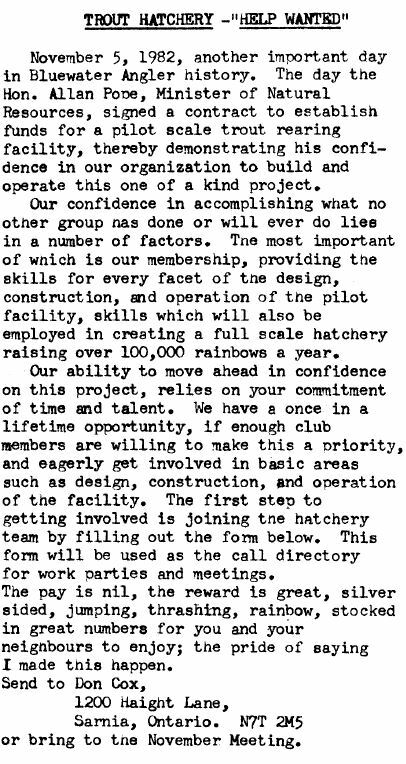 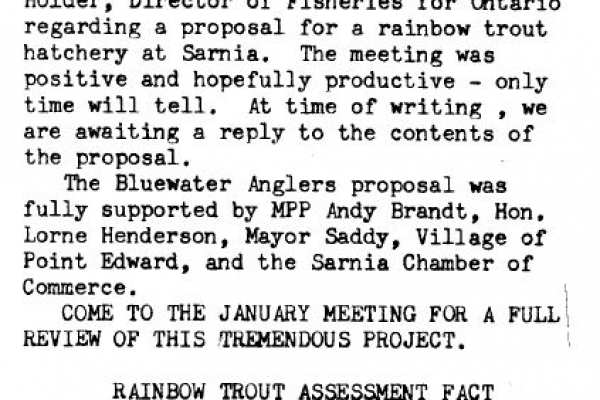 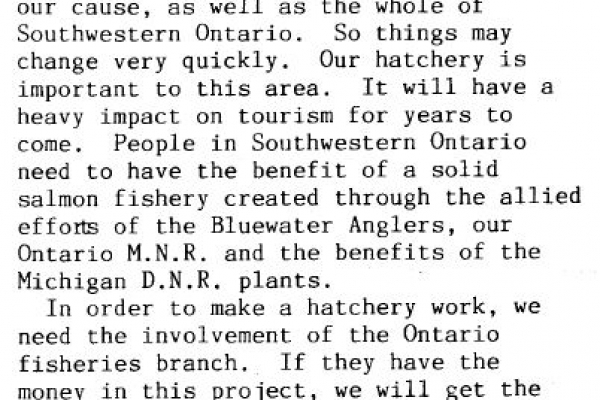 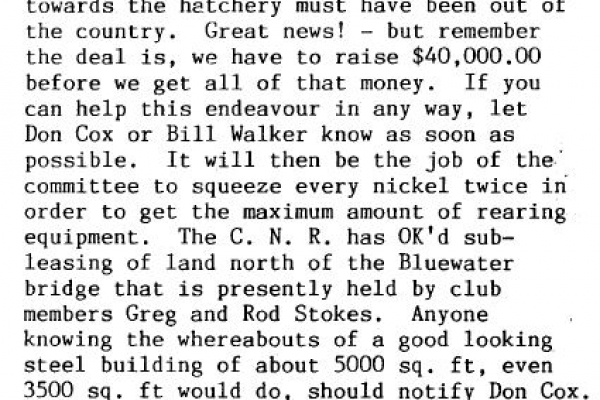 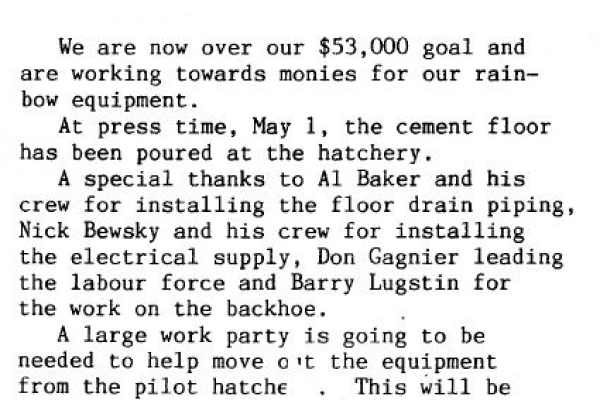 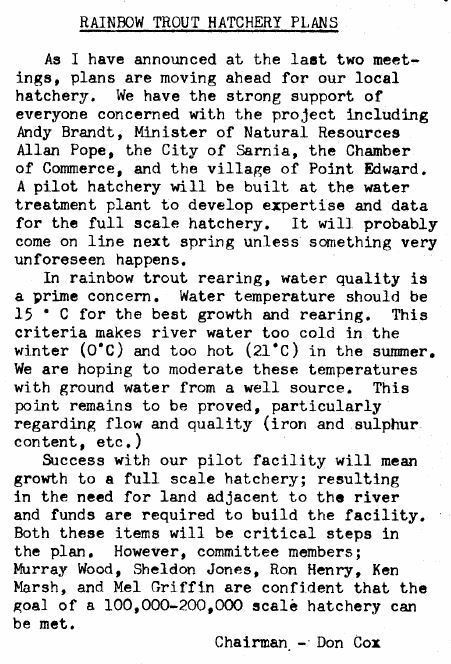 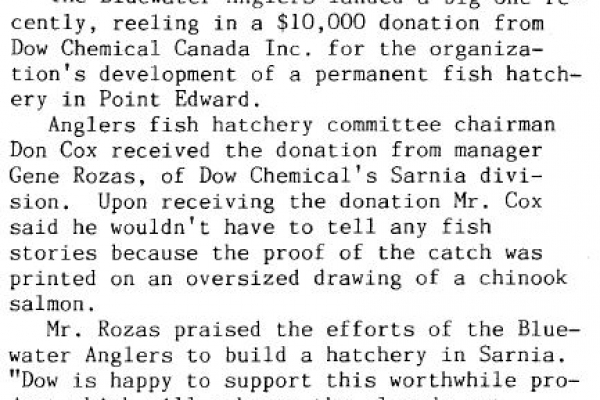 In 1981 the club formalized a request to the MNR for an experimental hatchery to be built & operated by the Bluewater Anglers with the MNR providing financial funding and technical support. 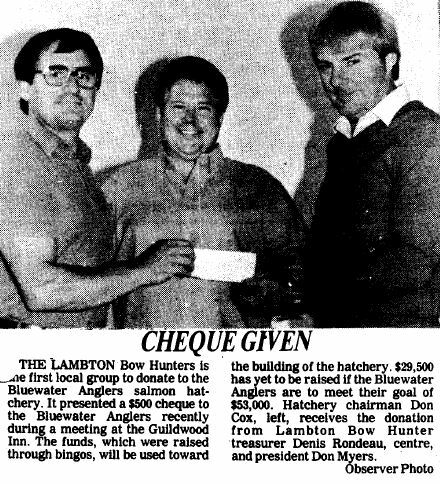 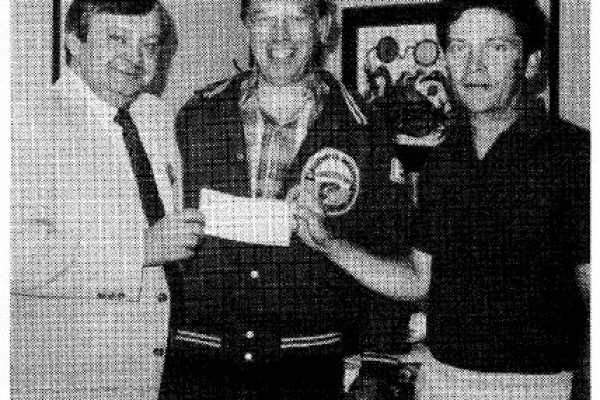 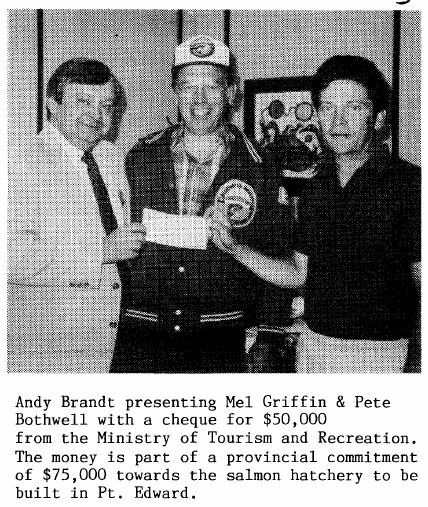 The idea took hold and resulted in The Bluewater anglers receiving grant of $30,000 in 1982 from The Community Fishing & Involvement Program (CFIP) for Ontario. 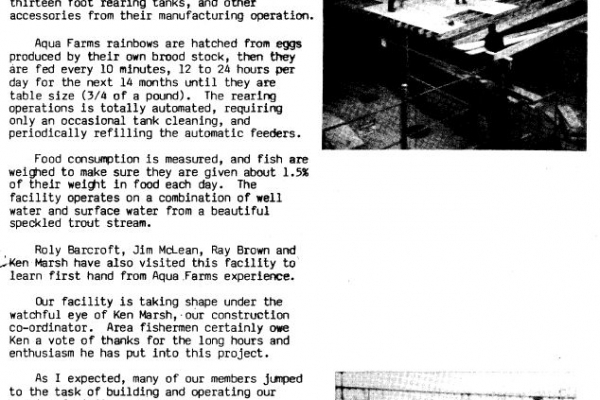 This experimental, or pilot, hatchery was constructed by members of the BWA in 1982. 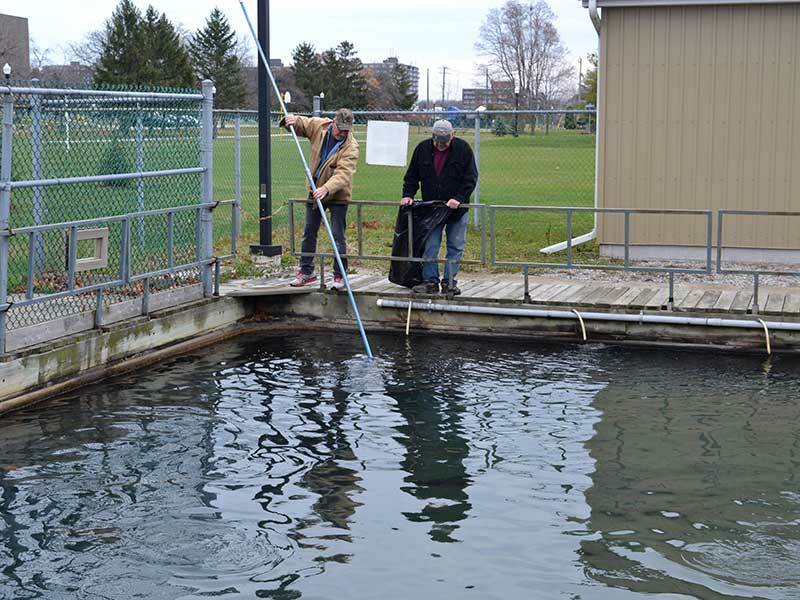 It was located on the water pumping station property in Point Edward which was owned by the MOE. 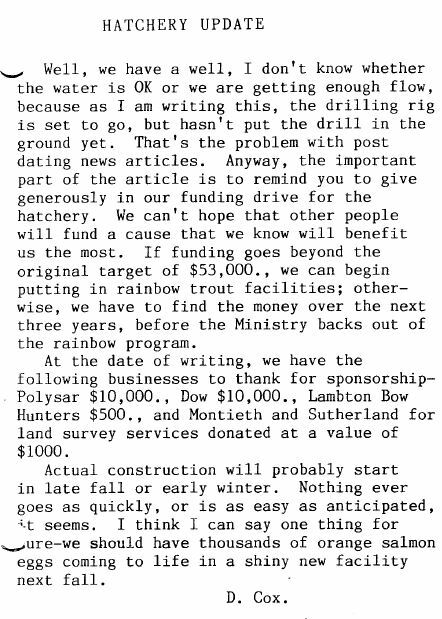 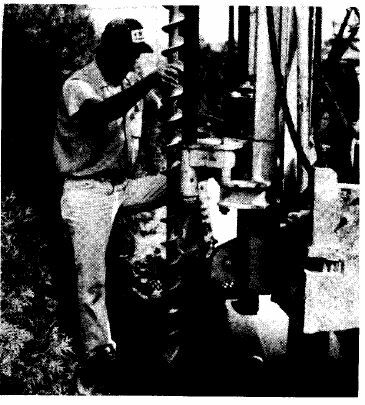 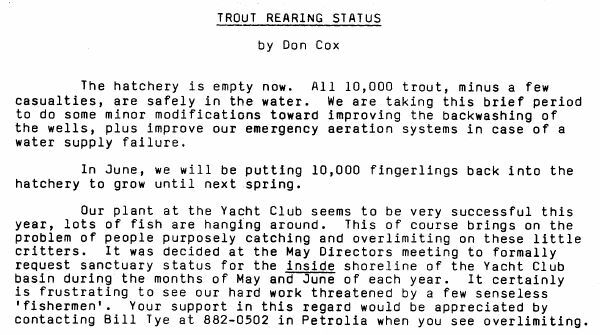 2 wells, 2” sand points were drilled during the summer of 1982. the facility was ready in late January of 83 and stocked with 10,000 Rainbow trout in February. 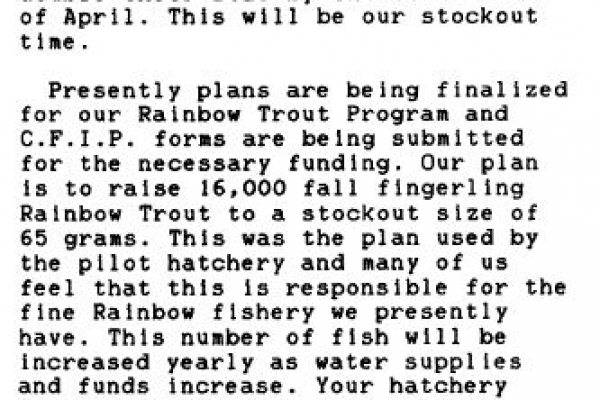 These initial Rainbow trout, approx. 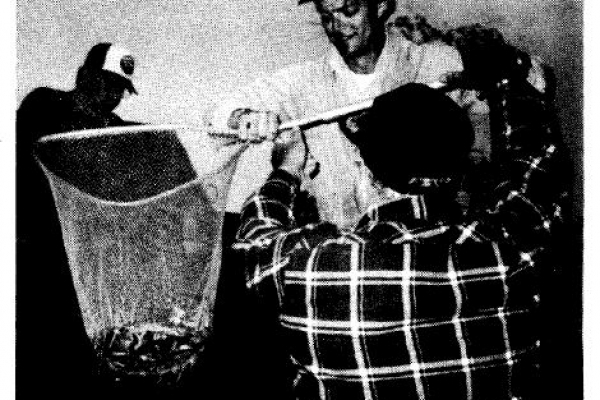 25 gr. 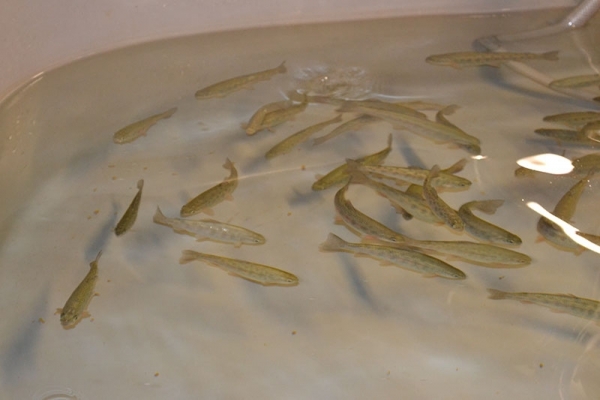 fish were the guinea pigs, from this first batch of fish it was learned firsthand how to successfully raise Rainbow Trout. 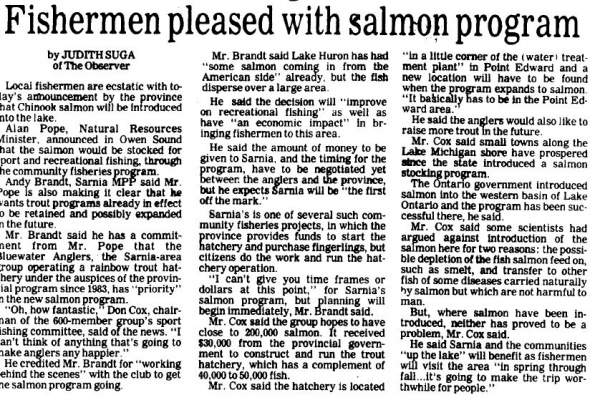 In August of 1984 the Ontario Ministry of Natural Resources sanctioned the Stocking of Salmon into the Canadian waters of Lower Lake Huron. 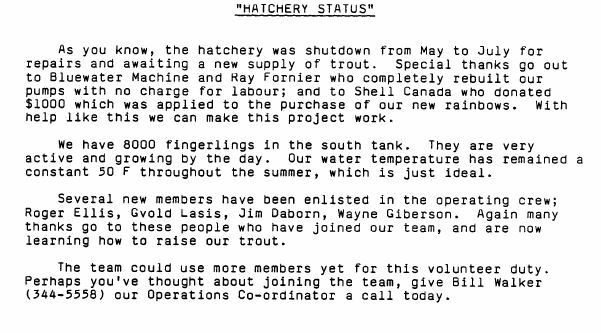 Our Club immediately petitioned the ministry to extend our Pilot Hatchery license to raise salmon during the final year of the 3 yr. 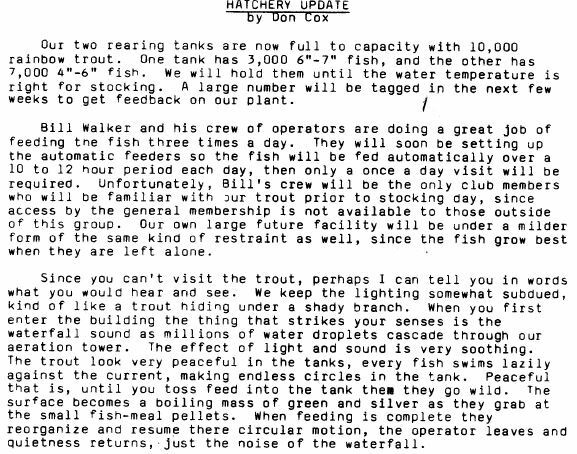 Pilot Hatchery Mandate. 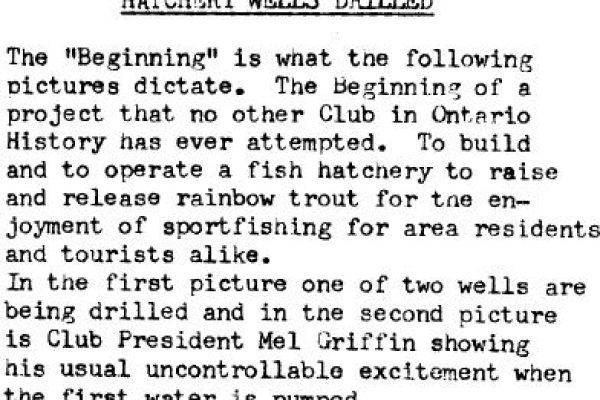 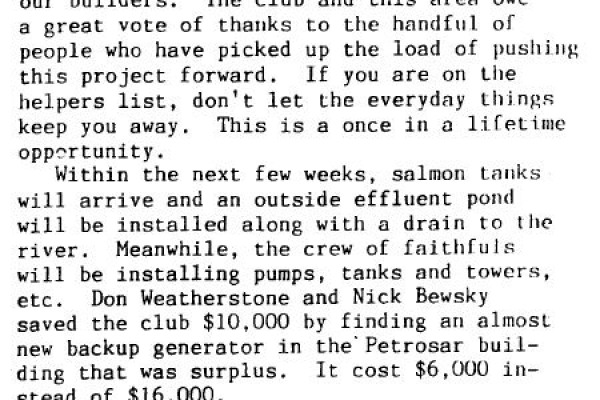 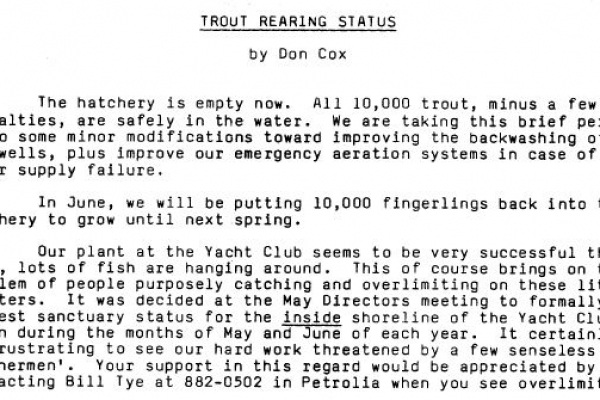 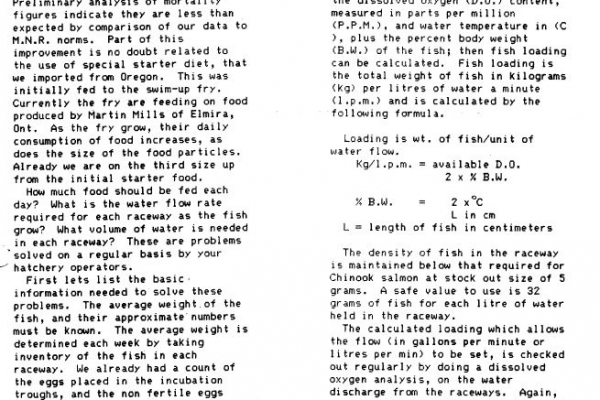 Through the direct personal support of Allen Pope, the Minister of the MNR, the club was authorized to raise Salmon. 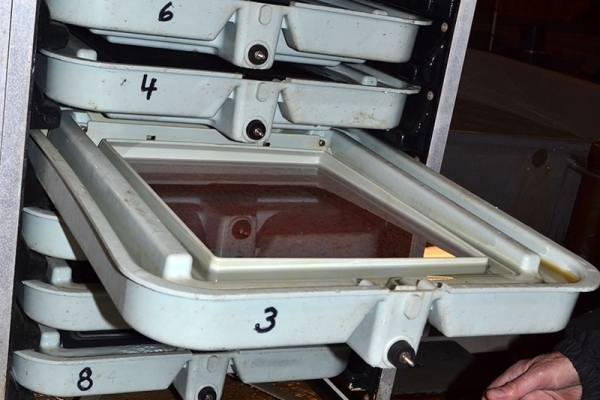 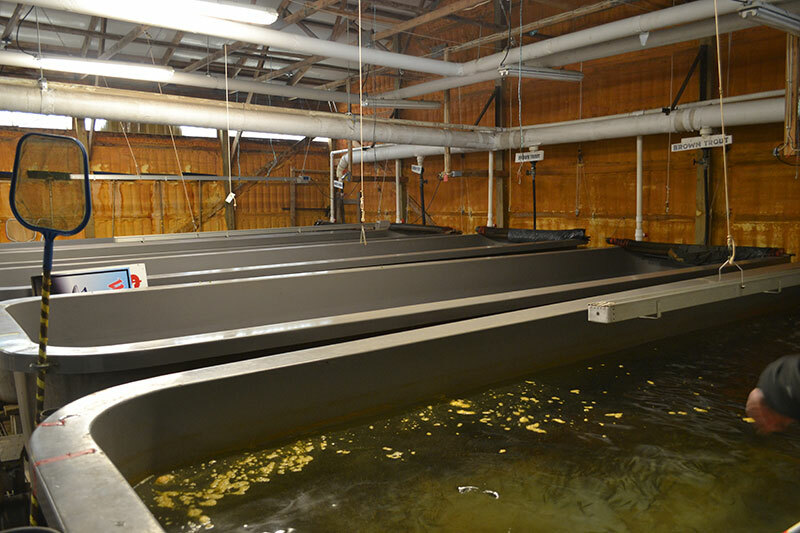 A small incubation trough was installed in the pilot hatchery and in Sept. of 1984, 35000 salmon eggs were fertilized and set. 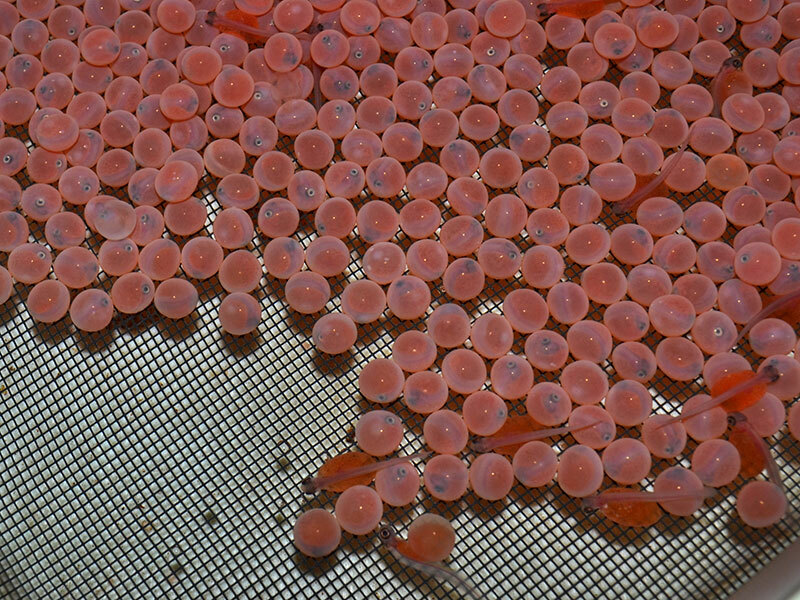 These eggs were collected by club members, from the streams of Rock Glen and Bright's Grove. 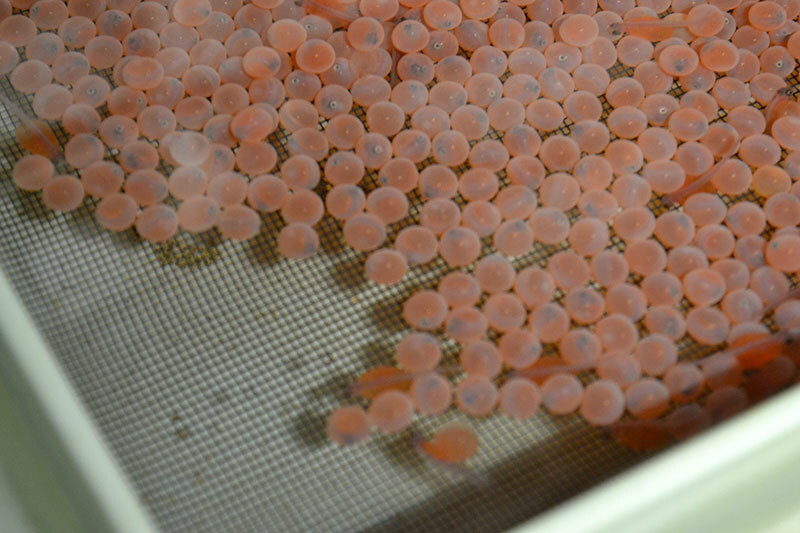 These eggs hatched in November and as swim up fry were on starter food by mid Dec. 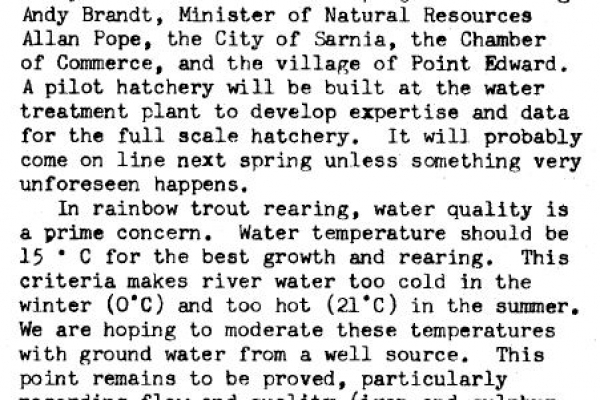 These original salmon smolts were stocked out into the Cull drain in May of 1985. 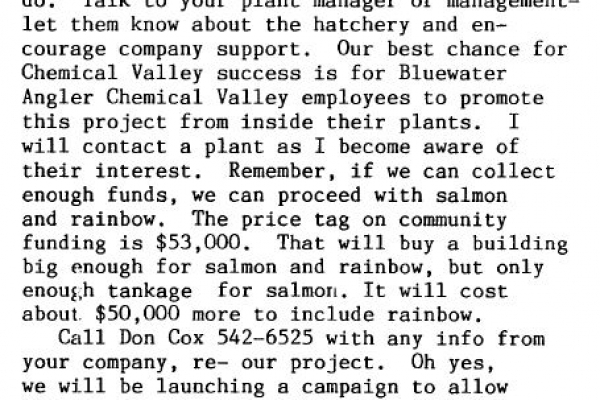 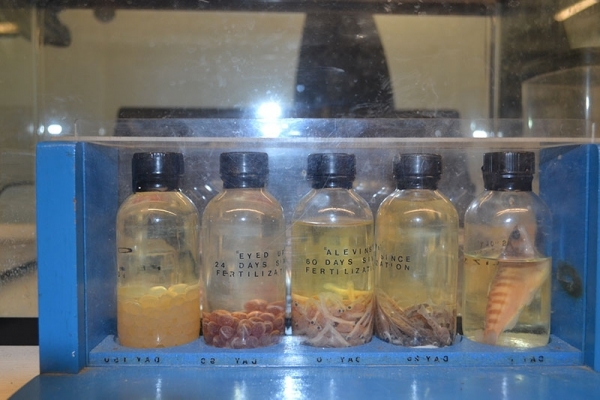 The inclusion of salmon in the pilot Hatchery reduced the number of rainbows to only 3,000 for 1985. 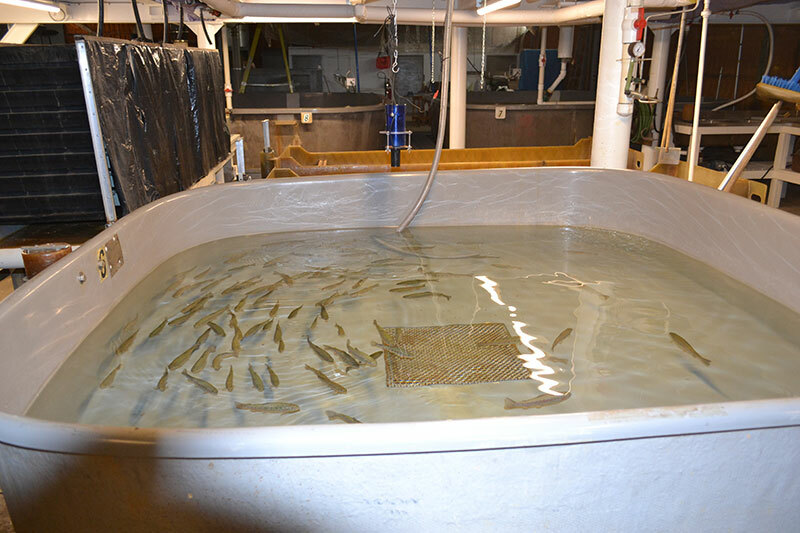 During the 3 years of the pilot hatchery operation 21,000 rainbows and 12,000 Chinook Salmon were stocked to Lower Lake Huron. 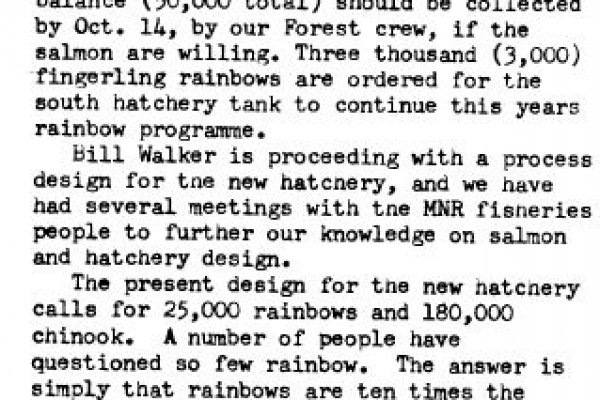 It was understood and included in an agreement with the M.N.R. 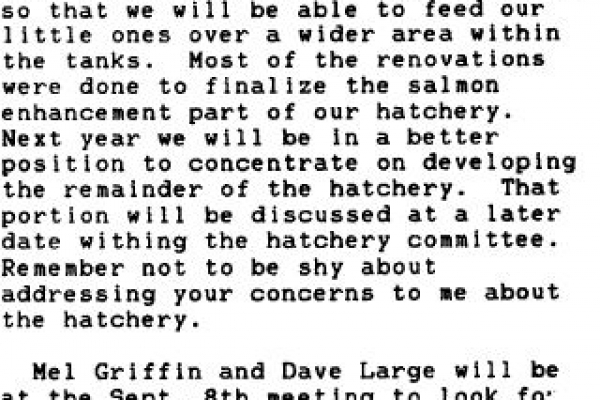 that success with the Pilot Hatchery program would be one of the requirements needed to lobby for a full scale permanent hatchery. 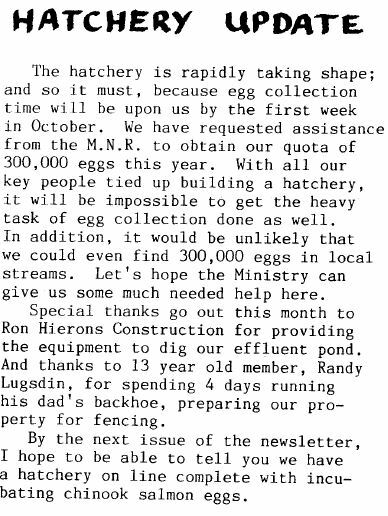 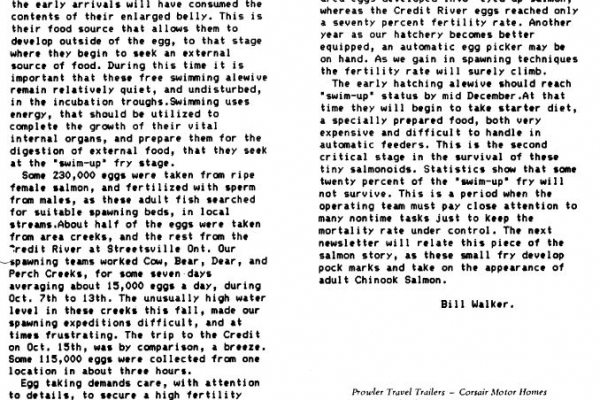 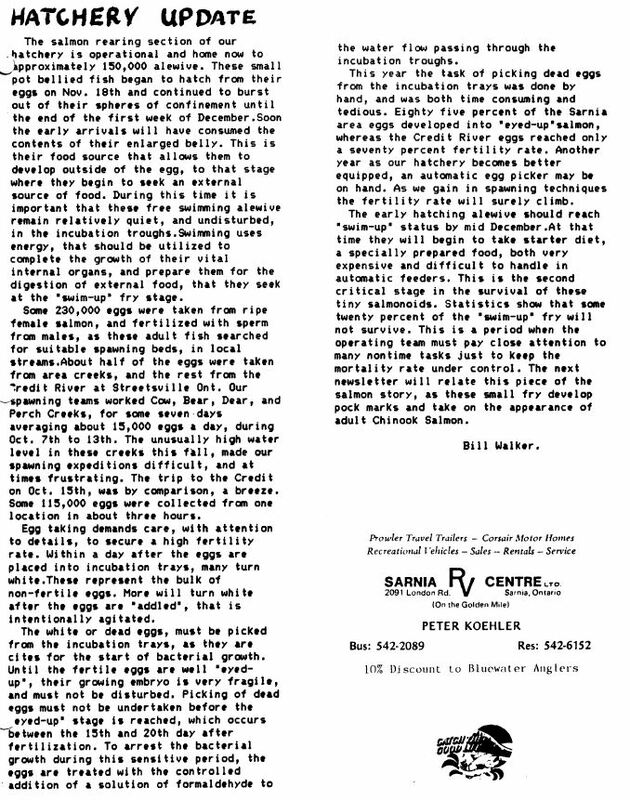 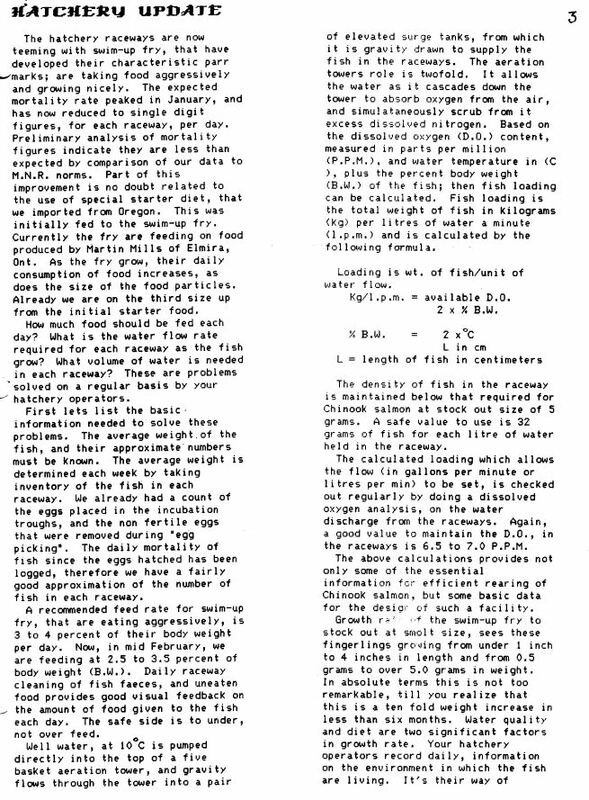 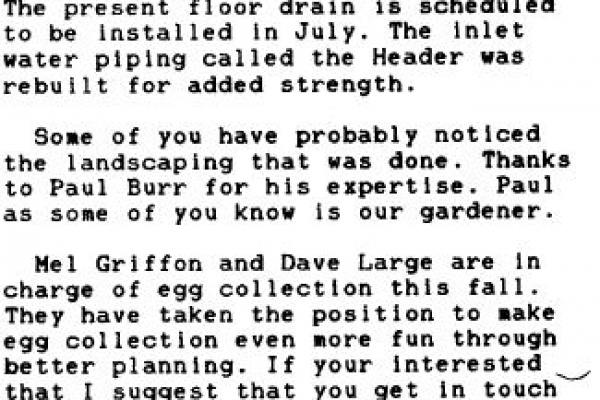 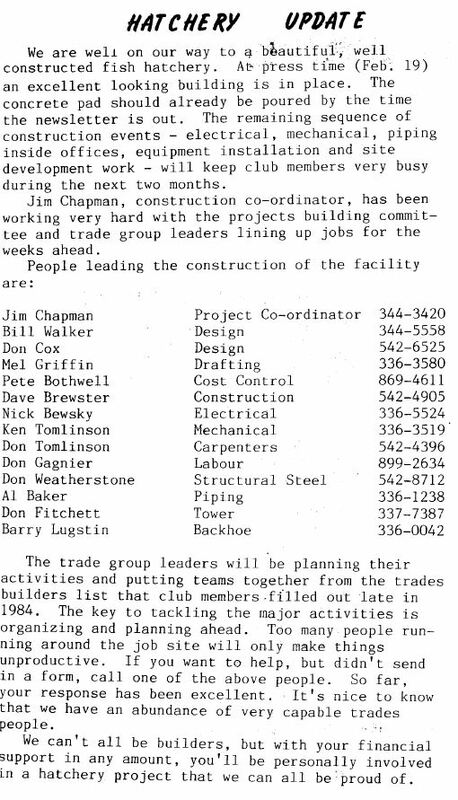 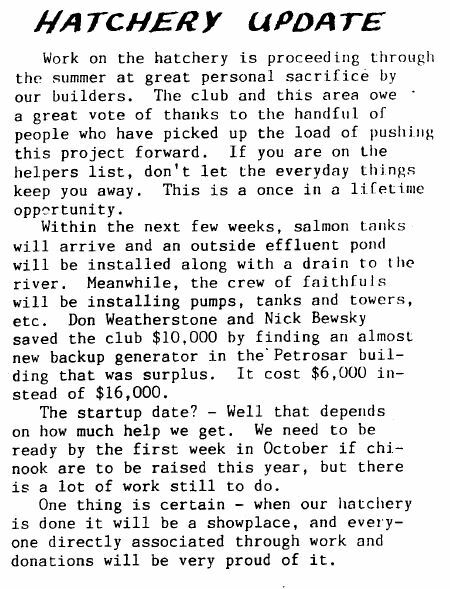 Formal support for the permanent hatchery began in Oct. 1985. 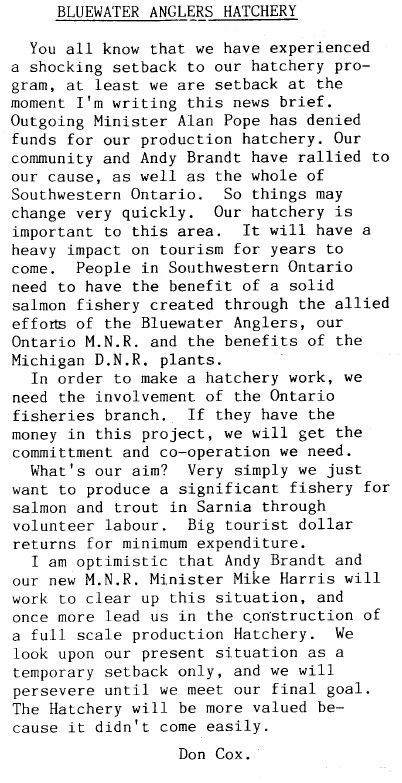 By late fall of 1985 agreement was reached with the MNR. 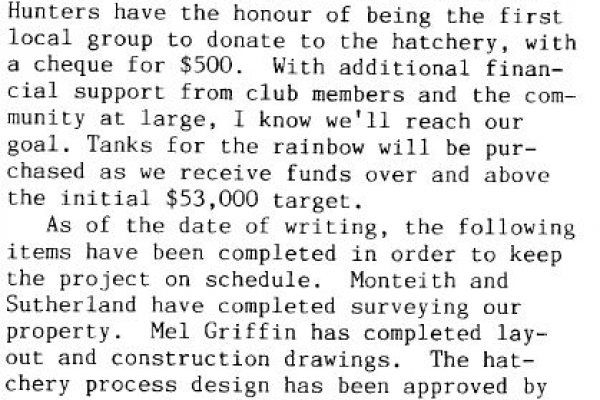 They committed to support the Permanent Hatchery construction with a total financial support of $106,000 on a 2 for one basis. 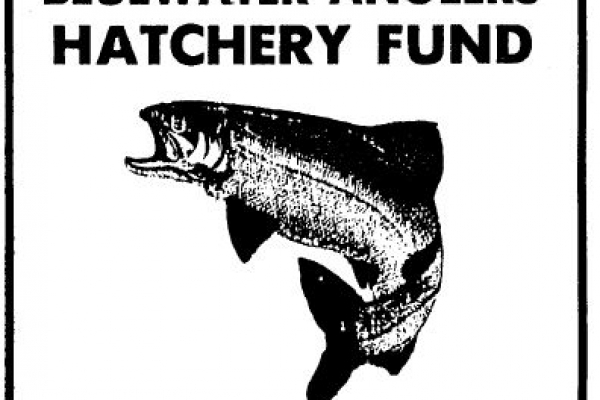 The Bluewater Anglers needed to raise $53,000. 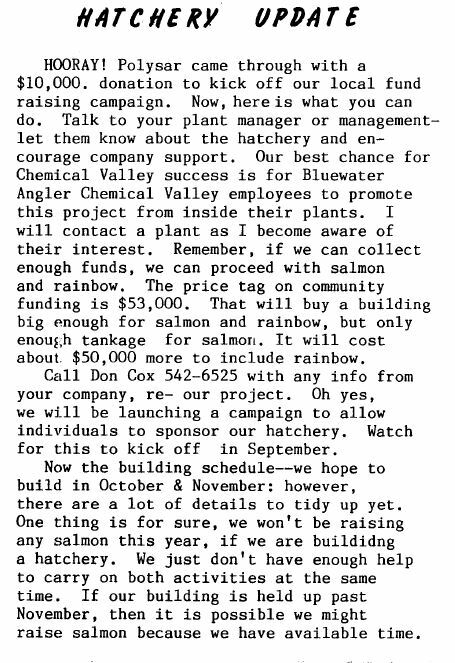 Through the support of citizens, other clubs and groups, small business and particularly the Industries of the Chemical Valley, the hard working club members were able to meet this goal. 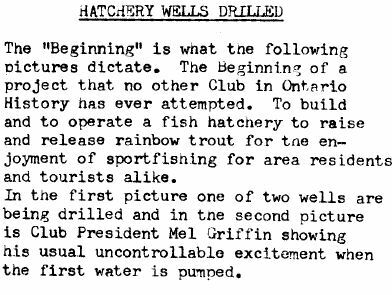 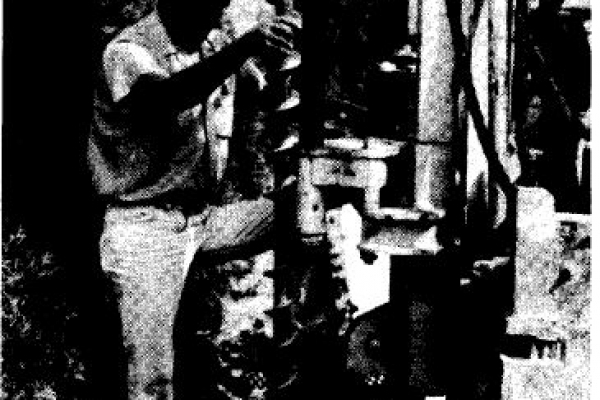 Our members built the Permanent Hatchery during the winter of 1985 with the drilling of 2 wells and the construction of a 50ft. 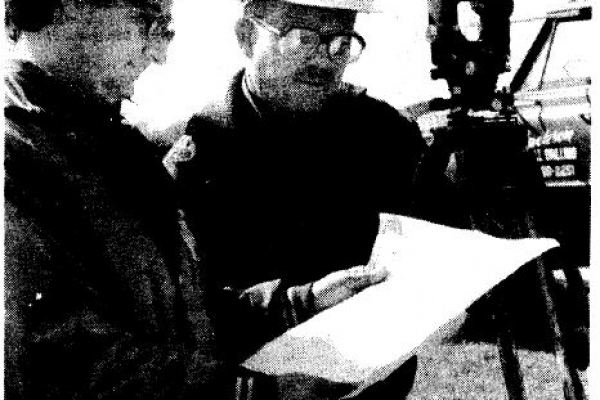 by 100 ft. pole barn. The facility was completed in September of 1986 with all equipment in place to raise 200,000 Chinook Salmon. 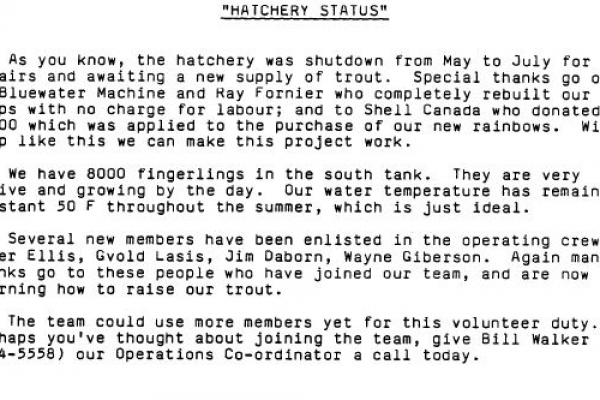 Phase One came on line in Oct. of 1986 with the release of 180,000 Chinook in May of 1987. 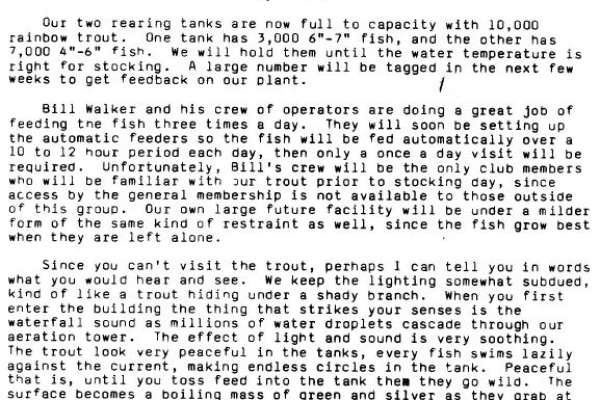 220,000 Chinook were released in 1988. 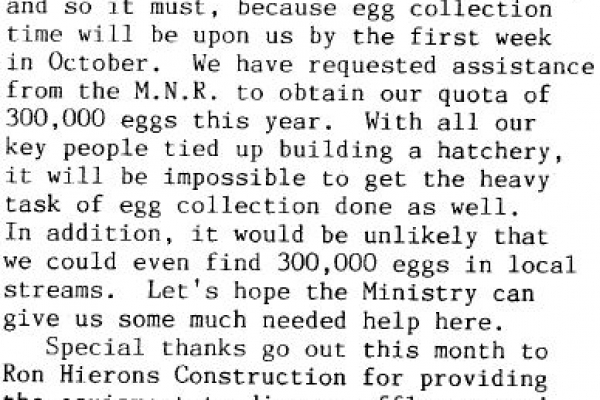 250,000 eggs were in incubation in the fall of 1988 for 1989 release. 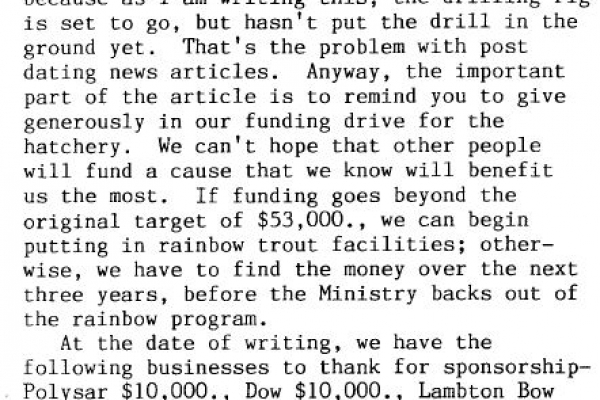 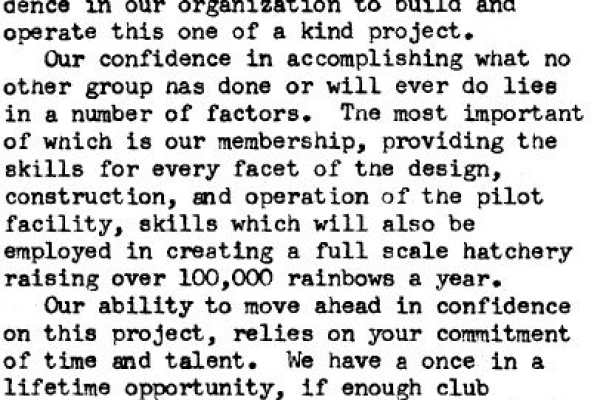 The agreement with the Ministry was they would continue stocking Rainbows until 1988 at this point the BWA would take over. 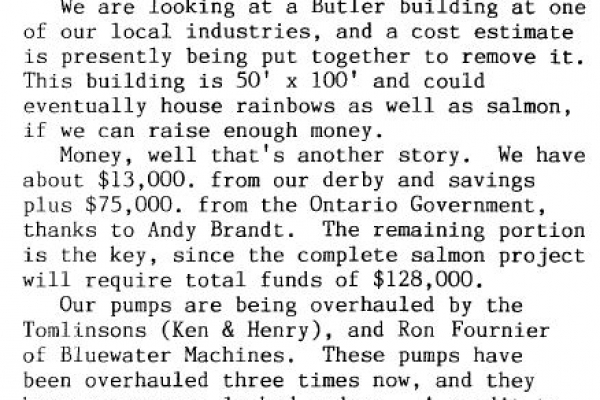 To complete the hatchery as designed, for both salmon and rainbows additional tanks, pumps piping and feeders were required. 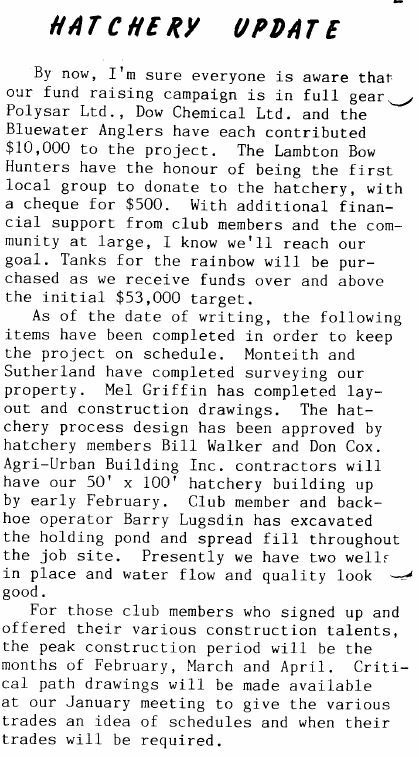 Another fund raising drive was initiated raising $50,000 for operation and construction of the facility. 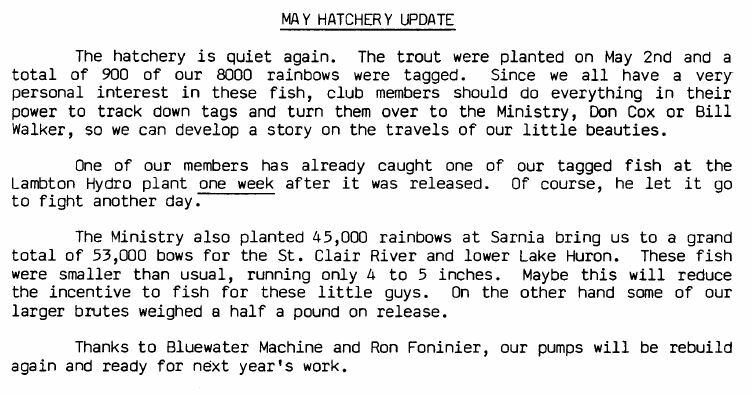 The rainbow portion of the Hatchery was completed in 1992 giving us an operational capacity for 50,000 rainbow trout and 200,000 Salmon. 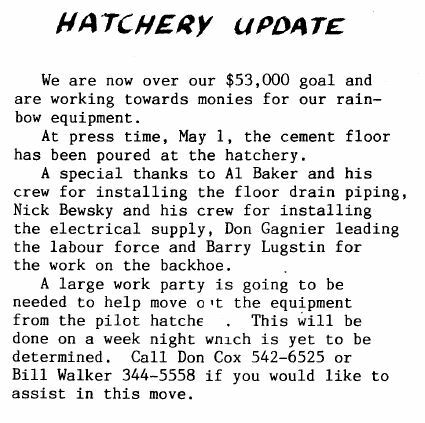 The hatchery as it stands today is the same as constructed in 1986 with a few modifications for efficiency. 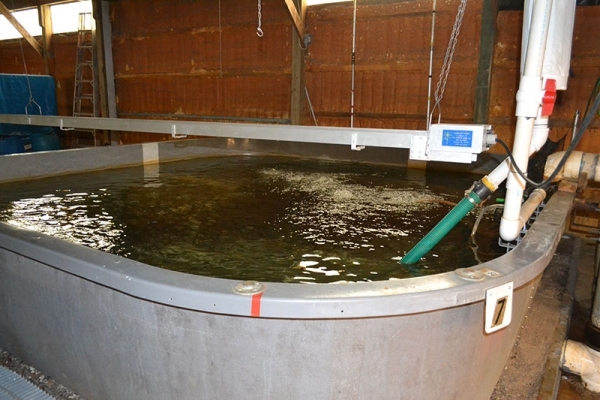 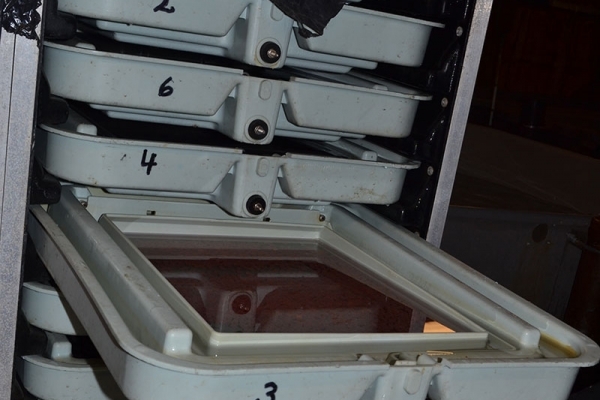 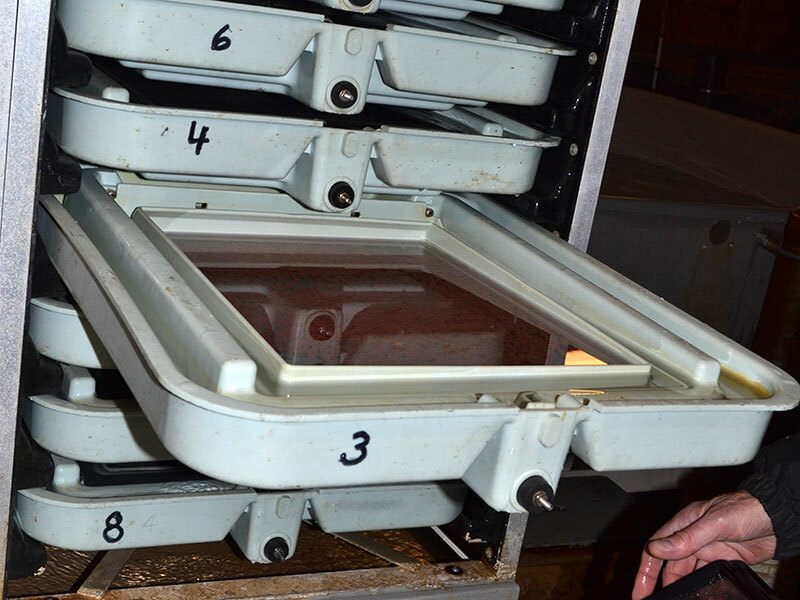 It still produces some of the largest Salmon smolts of any private hatchery. 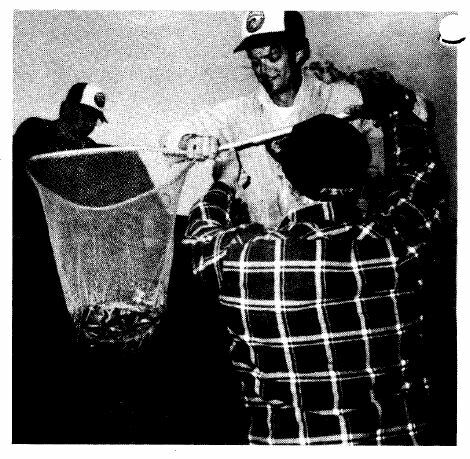 Click on the different categories (above pictures) to view more images.